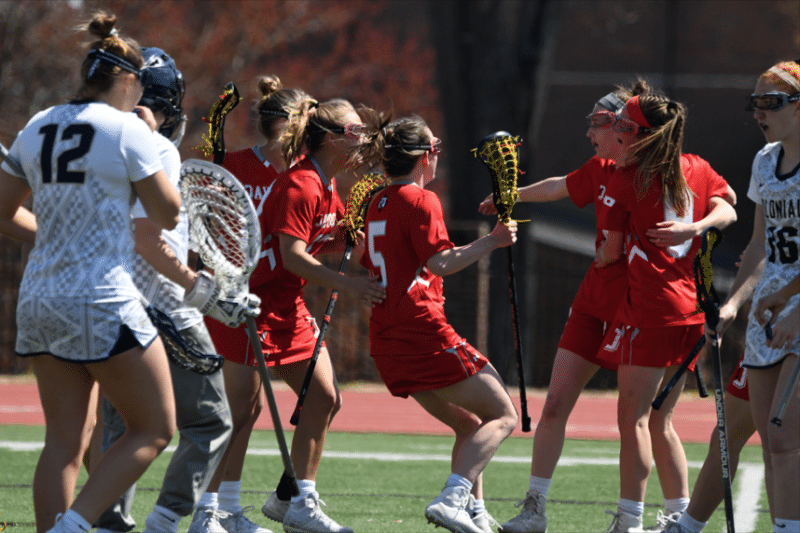 DAVIDSON, N.C. — Davidson returns home after a three-game road swing for its final regular-season game Saturday when it takes on St. Bonaventure in women’s lacrosse at Richardson Stadium. Davidson (7-9, 1-7 A-10) looks to close out the season on a winning note when it hosts St. Bonaventure (1-15, 0-8 A-10) Saturday afternoon at 1 p.m. Both teams will not advance to the Atlantic 10 Women’s Lacrosse Championship, which will be the first time for the ‘Cats since 2015 when they joined the league. The series vs. the Bonnies is six games old dating back to 2003 with Davidson leading 4-2. The Wildcats are riding a four-game win streak in the series, having outscored SBU a combined 46-9 in the past three meetings. Last year on the road, the ‘Cats took a 15-2 win as six different players had multiple goals. Sarah Kopp and Christine Molinari each registered hat tricks, while Sophia Sgroi, Tess Rieman, Shannon Blee and Katie Woodruffhad two goals apiece. A few Wildcats are slowly climbing the record books. Sarah Kopp is currently ranked in the top-10 in draw controls with 172, good for third-most on the career list. Her 54 caused turnovers are tied for eighth in the top-10. Sophia Sgroi has already set a single-season record for draw controls with 95, topping Emma Sissman’s 75 set in 2014. Sgroi’s 177 are second on the all-time list. Junior Shayne Antolini and sophomore Olivia Carey are making their mark in the assist category, with Antolini sitting at 56 for 5th place, while Carey has 43 and is 8th in the top-10 all-time. Goalie Delaney Guhman moved into the single-season top-10 with her 135 saves and her 46 groundballs are tied for seventh on the single season list. Feb. 11: Junior Delaney Guhman claimed her first Atlantic 10 women’s lacrosse weekly award when she was named the league’s defensive player of the week for games played from Feb. 4-10. Guhman helped Davidson open its 2019 season with a 12-4 win on the road at Winthrop with an impressive showing between the pipes. She earned her first collegiate victory by allowing just four goals, only one of them coming in the second half, while picking up six saves for a .600 save percentage. In addition, the Greensboro, N.C., native scooped up a couple groundballs. Feb. 18: Freshman Braeden Dial claimed Davidson’s second straight weekly award when she was named the Atlantic 10 Rookie of the Week for women’s lacrosse for games played from Feb. 11-17. The freshman from New Canaan, Conn., had a stellar outing in her second collegiate game in helping Davidson take a 13-8 home win against Furman on Saturday, Feb. 16. Dial led the team with a season-high four goals on seven shots, while adding a groundball and a draw control. Dial scored the first and second goals of the game for the Wildcats in helping it race out to a 9-1 lead in the first half. She then ended the scoring on the day with the final goal. Dial put six of her seven shots on goal. March 18: For the second time this season, freshman Braeden Dial was named the Atlantic 10 Rookie of the Week for women’s lacrosse for games played from March 11-17. Dial is the first Wildcat to win a weekly award twice this year and the first player in program history to earn the rookie of the week twice in a season since the Wildcats joined the A-10 in 2014-15. It also marks the 14th time overall Davidson has taken home one of the three weekly awards since joining the A-10. The freshman from New Canaan, Conn., had a stellar outing last week vs. William & Mary, recording her third game this year with four goals and fired off a season-best 12 shots, 11 of which went on goal. Dial added two groundballs, a draw control, and one caused turnover. April 1: For the third time this season, freshman Braeden Dial claimed the Atlantic 10 Women’s Lacrosse Rookie of the Week award for games played during the week of March 25-31. Dial already is the first Wildcat in program history to win the rookie of the week three times in a season. Dial led Davidson for the week in games at La Salle and home vs. Duquesne with four goals and four assists for eight points. She added two groundballs and a caused turnover, and converted her lone free-position shot. Dial tied her season bests with four goals and six points against Duquesne this past Sunday. She dished out two assists in a road win at La Salle on Friday, getting one groundball and a caused turnover as well. DAVIDSON — Davidson overcame a three-goal deficit in the final five minutes of regulation to force overtime, but VCU scored the game-winner a minute and a half into the extra period to pull out a 16-15 decision last Sunday. The Wildcats had won the opening draw in the extra period and even drew a free-position attempt by Lauren Arkell with 5:19 on the clock. But, her shot was saved by VCU’s goalie. Davidson (7-9, 1-7 A-10) overcame a three-goal deficit in the final 5:46 of regulation with three straight goals from Sophia Sgroi, Gianna New and Sarah Kopp to go to overtime at 15-all. It was Kopp’s third time this year with a hat trick, while New led Davidson’s offense with a season-best tying five points on three goals and two assists. Sgroi had two goals and two assists as did Braeden Dial, giving her team bests of 30 goals, 24 assists and 54 points. The first half had seven lead changes and six ties through the first 14 minutes of action. Three times Davidson had the lead only to see the Rams score on the next play. VCU eventually pulled away with three unanswered goals to go up 9-6 at halftime. St. Bonaventure — Goals from seniors Rylee Arnold and Abby Lagoner on Senior Day weren’t enough for the St. Bonaventure women’s lacrosse to keep up against Duquesne as the Bonnies fell, 18-5, last Sunday. The game was tied at 3-all early before Duquesne ran off a 13-0 scoring run in a 25-minute stretch to break open the game. The rain heavily impacted Sunday’s game. The sloppy conditions contributed to a combined 53 turnovers between the squads – 28 for Bonaventure and 25 for the Dukes. Duquesne was credited with 21 caused turnovers. Kathryn Yoder and Andrea Hill tied for the Bonnies team lead with three apiece. In net, Savannah Clarke had six saves on 24 shots faced. The Wildcats are not in the top-six of this year’s A-10 standings and will not advance to this year’s A-10 Lacrosse Championship, snapping a three-year run.